UPDATED: Wed., March 28, 2018, 7:10 p.m.
LOS ANGELES – Two weeks of mayhem – a tumult of historic upsets, buzzer-beaters and at least one celebrity nun – have brought the NCAA Tournament to a crossroads. The Final Four in San Antonio this weekend will feature favorites and underdogs, traditional programs and a brash upstart. Which begs the question: Will this tournament ultimately revert to form or deliver true madness? In the aftermath of this weekend’s regional finals, the oddsmakers apparently can think of a few reasons. They have made third-seeded Michigan an early favorite over the 11th-seeded Ramblers and figure Villanova should handle Kansas in a more conventional matchup of No. 1 seeds. But the past two weeks have proved that seedings and pedigree don’t necessarily matter. Saturday, one side of the bracket – East versus Midwest – will represent the status quo. Villanova looks like the team to beat if only because the Wildcats, in the Final Four for the second time in three seasons, have found a variety of ways to win. After racing through much of the tournament with offensive punch, Villanova made only 33 percent of its shots – and about 17 percent of its 3s – against Texas Tech on Sunday. The Wildcats’ 71-59 win had everything to do with defense and free throws. “We played a really tough basketball team that had us scouted extremely well, took away our 3s, really tested our ability to play tough and ugly,” coach Jay Wright said. They now face a Kansas squad that defeated Duke 85-81 in a battle of blue bloods that stretched into overtime, the Jayhawks advancing beyond their region after near-misses the past two seasons. Their matchup at the Alamodome pits two of the nation’s top players – Villanova junior Jalen Brunson versus Kansas senior Devonte’ Graham – in a game that will send one team to the final as a clear favorite. The other side of the bracket – West versus South – is more unorthodox, thanks to a string of upsets that left countless office pools in tatters. Though Michigan is a reasonably high seed, the Wolverines spent much of the season looking ordinary. Turning things around after a February loss at Northwestern, they have forged a 13-game winning streak on equal parts hustle and grit. That type of effort was essential in the West final against a Florida State team that deploys wave upon wave of bench players, hoping to exhaust opponents. If there has been anything traditional about this tournament, it has been the notion that defense wins championships. Even after Virginia – surrendering a nation-best 53.4 points a game – lost a first-round shocker to Maryland-Baltimore County, becoming the first top seed to fall to a No. 16 in NCAA history, the idea of shutting down opponents remained a popular theme. Villanova and Michigan weren’t the only teams crediting defense for their regional wins. 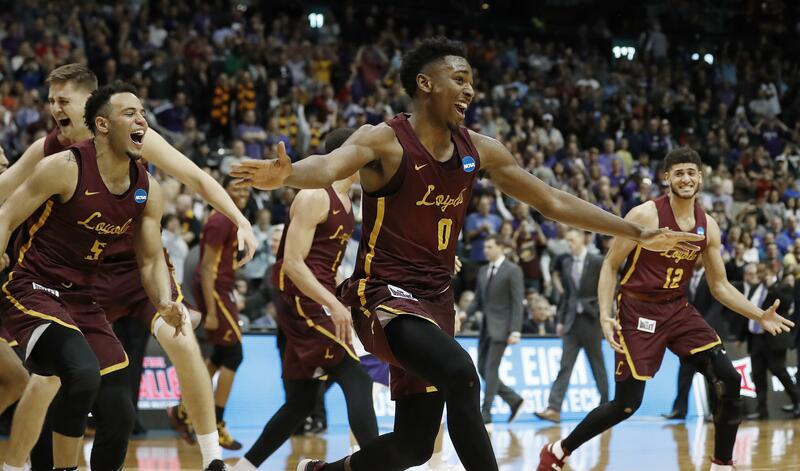 Loyola-Chicago, which shot a healthy 57 percent in the South final, talked about limiting Kansas State to 35 percent. “Our defense dictates everything,” coach Porter Moser said. If nothing else, the allure of the underdog should make the Ramblers, winners of 14 games in a row, a fan favorite in San Antonio. The Midwestern school also has something of a pop culture phenomenon in Sister Jean Dolores Schmidt, the 98-year-old nun and team chaplain. Television cameras have made a habit of showing her on the sideline and a bobblehead has been rushed into production. “I just know you see her all over social media,” Michigan guard Muhammad-Ali Abdur-Rahkman said. Only three other 11th seeds have made the Final Four; none has made it to the championship game. So the Wolverines understand that much of the nation is rooting for this unusual tournament to produce a fittingly quirky end. They also appreciate that anything can happen. Published: March 28, 2018, 4:49 p.m. Updated: March 28, 2018, 7:10 p.m.